Today I had a great gardening-related day. I drove over to San Francisco for the California Rare Fruit Grower’s 2006 Golden Gate Chapter Scion Exchange. 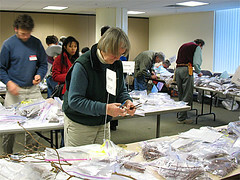 When I first went in, I was so overwhelmed by the number of bags of scions (cuttings). This was my first time at any gardening function like this and I didn’t know quite what to do… so I told the woman at the door that I’ve never been to anything like this and I asked what do people here. She explained that you basically go through the tables of bags filled with scions and if you see something you like, take 1 or 2. Then take some tape and label your scion with the name that was on the bag. They had so many varieties of different fruit trees, like apples, pears, asian pears, peaches, asian and european plums, nectarines, pluots, figs, pomegranate, kiwi, grapes, mulberries, persimmons and more. 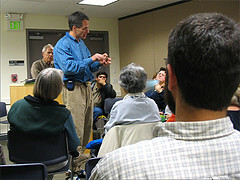 Their were many group members who were happy to answer your questions. One of they said that even if I didn’t know how to graft trees, there were some scions that can be rooted like the figs, kiwis and pomegranate. 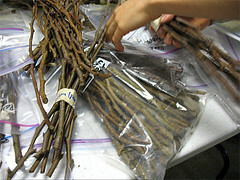 At 1pm the had a grafting demonstration, which was very informative. There’s nothing like actually seeing someone do it up close. I made a flickr set ( link ) with some photos from the event. Clicking many of the photos below will link you there. Afterwards, I drove back to home to Vallejo, but first, I passed by Mid City Nursery to see if they had any grafting tape. They had so many bare rooted trees for sale. 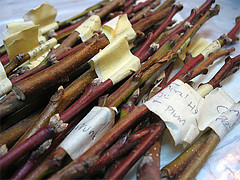 One of the nursery workers showed me a “4-in-1 Fruit Salad” tree grafted with Plum, Apricot, Peach and Pluot. The owner told me how his father just used electrical tape to cover the grafts that he made. This entry was posted in Uncategorized and tagged dahlia giraffe, field trip, grafting, mid city nursery, peruvian daffodil, purchase, scion. Bookmark the permalink.